DIVORCE – CAN YOUR CHILD SURVIVE? Sometimes the Jerichos in our lives crumble over night. In other instances, it is a slow process, where one brick is removed at a time to eventually dismantle a stronghold. Similarly, marriages often end in divorce, and crisis and change overwhelm not only the parents’, but also the children’s lives. Walk this journey with me as I gently and respectfully explore one of the most influential changes that children often face – divorce. According to statistics, one out of every two marriages end in divorce. The results of research done on the effects of these divorces on children will make any parent cringe. Still, I would like to highlight just a few of these issues, as the magnanimity of this topic must be imprinted in our minds. This discussion is by no means an attempt to condemn any parent, but rather an aid in helping us to look up from our demanding lives when a child we love is sending out SOS signals. Steven Lazarus emphasises various effects of divorce on children, which I will briefly refer to here. The first effect I would like to underline with a bright green highlighter involves relational problems. Children from divorced families are significantly more involved in anti-social behaviour than other children. These ‘divorced children’ have often been found to have problems with their friends, as well as with authority figures. Such relational problems often stem from witnessing parental conflict, which presents an inappropriate model for kids, who are still learning how to deal with their own relationships. Secondly, Lazarus points out that children from divorced families fare significantly worse than children from married families in their academic work. A weakened self-concept is often another unfortunate consequence that stems from the tension involved when one parent leaves. The negative effects of divorce on children have been proven to be worse when maternal and paternal warmth is low (with higher levels of anger and tension), and when mothers struggled with depression. Interestingly, boys tend to have more externalizing behaviour problems compared to girls: this could include running away from home and suspensions from school (we are here not talking about cute impudent little rascals to the likes of Tom Sawyer and Huckleberry Finn!). On the other hand, girls tend more towards depression and anxiety. Once you are aware that a child is struggling under the load of a divorce, there are ways in which you can provide help. The following factors have been proven to bring back those peanut butter and jam moments! Active and continued involvement by both parents in the children’s lives is essential. It is thus important that a positive relationship with both parents, or at least with the primary caregiver, is fostered and maintained (see Bowlby’s Attachment Theory) . This means no ‘caster oiling’ (my term for bad-mouthing!) of one parent of the other. 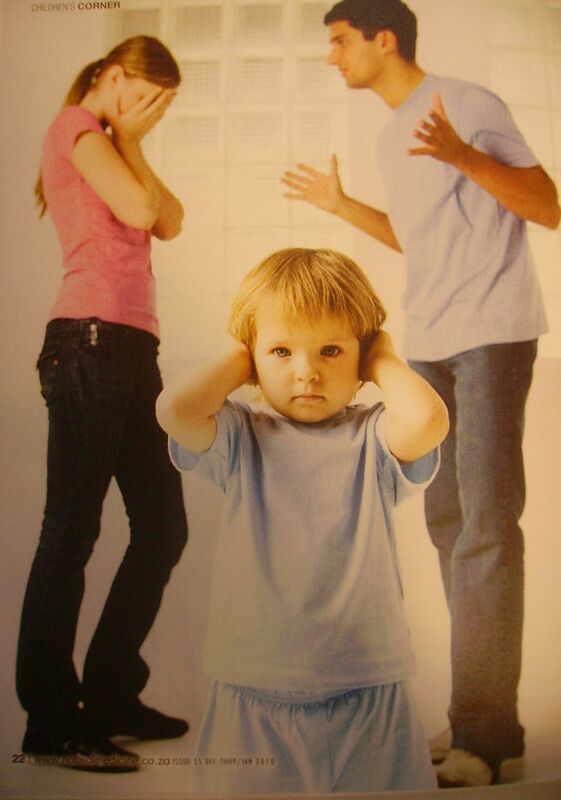 The more you fight, the more difficult it is for your children to adjust to the divorce. Encourage them to visit the non-custodial parent. If this is a tricky and sticky endeavour, interventions that enable parents to settle disputes are advisable: this could involve therapy for parents, mediation and collaboration between attorneys, mediators and therapists. Therapy for children also serves as an anti-bacterial band aid! Children are often confused by the divorce: because they were not in the marriage, and often did not experience it as destructive, they can not understand the reason for the divorce. A therapist or counsellor can help a child to get some distance from the puzzling situation and see the picture as a whole. Do keep in mind that some psychological problems might only develop later in their lives, as children often do not have the emotional capacity to deal with such issues if parents divorce when they are still very young (see “The Sleeper Effect”). Do tell your children repeatedly that the divorce is not their fault. Parents can add some more dettol and stitches by explaining to children what the divorce will mean for them in practical terms: when will they see the non-custodian parent, how often and for how long, what will happen at birthdays and school functions. Avoid the temptation of asking the children to carry messages or to tell you about your ex-spouse. Economic stability and routine during this time have also been proven to be helpful. Lack of stability, routine and predictability can significantly increase the negative effects of divorce. Then, a last tip from me while I am playing helping Hilda: go green. No, I have not had too many cappuccinos (I am in fact having some peppermint tea). Kids who participate in extracurricular activities, build life skills of cooperation, learn self worth and obtain healthy minds and healthy bodies. Get out the picnic basket and head for the great outdoors! And if your budget allows for it, perhaps go for a drive to the SPCA and pick up little homeless Rover or Spotty – this will keep your children’s minds busy in a constructive and positive manner! Something you probably wouldn’t have thought of is some Elastoplast for YOU! Keep yourself healthy. For many adults, separation and divorce is one of the most stressful experiences they will ever go through. Finding ways to manage your own stress is essential for you and your entire family. As my favourite South African Airways allegory for life goes: first put the mask over your own mouth before you help the person next to you. You might just faint before you get to your loved one. In line with this, do not allow your children to become your best friends or confidants – do consider seeing a counselor or therapist, or a friend who is both, but with some tea and cake! I would like to conclude with a message of hope. Similarly to the bottle of Domestos in their advertisement, the one with the little one-eyed blue germ who comically and confidently sings: “I’m gonna give them diarrhoea!”, I want to blast that little blue monster of despair right out of this place! Studies on this topic, children through divorce, have indeed shown that one year after the divorce, many of the children’s problems diminish and by the end of the second year, 75%-80% of the children appeared to be functioning close to normal (see Lazarus). I found this beautifully positive testimony (another germ-blasting moment!) on the internet: One parent, who successfully navigated the vicissitudes of divorce with her kids, likens the process to traveling internationally with children. You don’t know what to expect, but you hope that your children will develop a willingness to be flexible, adapt to different ‘cultures’, and learn and grow throughout the challenges, rather than shrink from them. Rather than approach the process with fear and trepidation, think about the lessons that can be gained and expect that, with your support, your kids will flourish. Thus, the quality of your lives does not have to be overshadowed by divorce. It will affect you, but to what extend is up to you! Botha, A., Van de Berg, H.S. & Venter, C.A.V. “The Relationship between family-of-origin and marital satisfaction”, Health SA Gesondheid 2009; 14.1. Lazarus, S. “The Effects of Divorce on Children. How Can We Help?” Familyresource.com. 21 Oct. 2009. Meyerowitz, J. “Divorce Counseling – Helping Children Cope with Divorce.” FAMSA. 18 Oct. 2009. Eagen, C.E. “Attachment and Divorce: Family Consequences.” Personality Papers. 19 Oct. 2009. Eleoff, S. “An Exploration of the Ramifications of Divorce on Children and Adolescents.” The Child Advocate. 19 Oct. 2009.